Richard Nixon is back. He’s every bit as ugly and every bit as evil as he ever was. Right now he’s inhabiting Barack Hussein Obama. But soon he’s planning to don a pant suit. Almost six years later most Clinton aides can still rattle off the names of traitors and the favors that had been done for them, then provide details of just how each of the guilty had gone on to betray the Clintons—as if it all had happened just a few hours before. The data project ensured that the acts of the sinners and saints would never be forgotten. There was a special circle of Clinton hell reserved for people who had endorsed Obama or stayed on the fence after Bill and Hillary had raised money for them, appointed them to a political post, or written a recommendation to ice their kid’s application to an elite school. On one early draft of the hit list, each Democratic member of Congress was assigned a numerical grade from one to seven, with the most helpful to Hillary earning ones and the most treacherous drawing sevens. The set of sevens included Sens. John Kerry, Jay Rockefeller, Bob Casey, and Patrick Leahy, as well as Reps. Chris Van Hollen, Baron Hill, and Rob Andrews. Claire McCaskill made the list for telling the late Tim Russert that Bill Clinton was a fine President, “but I don’t want my daughter around him.” She apologized directly to Bill Clinton, but when she endorsed Barack Obama, all previous sins were unforgiven, too. Team Clinton carefully noted each perceived slight and betrayal — in Excel spreadsheets! — and exulted when their nemeses stumbled. Perhaps not. But perhaps it’s not the healthiest thing for Democrats to give her the opportunity to become one, either. There are two amazing things, with one more amazing than the next: the sheer wickedness of the modern Democrat Party and the willingness of the American people to vote for their own suicide-by-socialism as they listen to the biggest lies in American history. I’ve said it over and over again: Democrats are fascists. The only difference between the Nazi Party (National Socialist German Workers Party) and the Democrat Party (National Socialist American Workers Party) is the fact that the Nazis were able to seize absolute power and impose all the wickedness and viciousness in the dark, shriveled souls and the Democrats are still hoping for that chance. Why do I say that? Because the Nazis, the Stalinists, the Maoists, the North Koreans, the militant Muslims and the Democrat Party ALL have ONE thing in common: they exalt the State to the point of deity. They ALL desire and demand and seek to impose a massive, totalitarian State with absolute power. And as we saw in the case of Obama and his repeated abuses of power, power corrupts. Hillary Clinton is pure evil. This is a woman who is now documented (along with Obama) in being so cynical and so utterly uncaring about the American people or the security of the United States that they were willing to destroy a sound war-fighting policy that accomplished our mission and saved American lives for nothing more than sheer political benefit. She will stop at NOTHING to get power. And she will stop at nothing once she TAKES power. 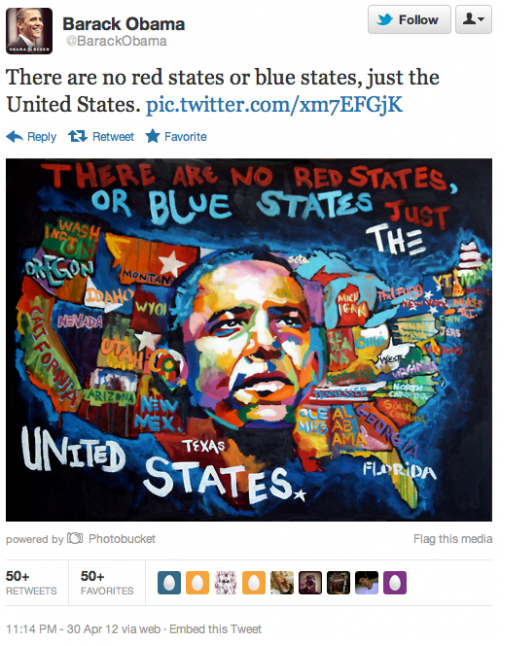 In other words, there are no red or blue states … just the Obama States. You have to love the narcissism of a president who posts a picture of himself at the center of America, presenting himself as greater than the country, all of which is united under his hopey-changey administration. This is 1984-type stuff. This is the most polarizing president in American history, and he’s busy telling us that we’re all united under his auspices. War is peace. Poverty is wealth. Polarization is unity. United States is Barack States. This shocking narcissistic chutzpah is also being decried on Weasel Zippers. Obama is sick. His many sycophants in the most partisan and poisonous propaganda media are sick. He’s leading us to ruin. And demanding that we worship him for doing it. Now don’t forget to have your Two Minutes Hate at Emmanual W. Bushstein. Or the Obama media will find out and add you to Obama’s enemies list. Is Obama Closing Dealerships As Political Punishment? I’ve been trying to sort out why it would be beneficial to shut down car dealerships when the auto industry is facing bankruptcy. After all, more dealerships means more car sales. And it would very much seem that more sales would be a good thing for a struggling industry. It would be one thing if the dealerships were corporate-owned. Corporations shut down underperforming locations all the time in order to consolidate cash and improve profitability. But the dealerships that are being closed are NOT corporate-owned; they are private. So you kind of have to wonder what is going on. On possible reason is that fewer dealerships will be able to create more sales and therefore create more “buzz” by improving facilities and having more potential customers. Call it the “wow” factor. In any event, the real question is why some dealerships are closed and others are allowed to remain open. One big example in my own local area is Dodge City Chrysler in La Quinta, the management of which was stunned to find the dealership on the closure list. They are appealing the decision, but intend to remain open even if they are “closed” by Chrysler as a service department and as a pre-owned dealership. The only thing that stands in the way of that plan would be that the current zoning laws don’t allow used car sales. But the city promises to work with Dodge City if the appeal fails. Why close down Dodge City? It’s turning a profit. It’s successful. We find out the decision to close dealerships was made by the Obama administration’s task force, and NOT by Chrysler. And we begin to find out a great deal more about the dealerships that were closed, and what political contributions they made to which political causes, as well as dealerships that are being allowed to remain open, and what political contributions they made to which political causes. ChryslerDealershipShutdown examines the political donations of dealerships scheduled to close versus those that are being allowed to remain open and leads to a frightening conclusion: it very much appears that dealerships are being closed down because of their political contributions, rather than because of purely business considerations. This work builds upon the research done by numerous parties, most notably Joey Smith. It is a follow-up to my original post, entitled “Did anti-Obama campaign contributions dictate which Chrysler dealers were shuttered?” The odds that these closings occurred without partisan bias are roughly equivalent to the odds that Jean Claude Van-Damme will grab a Best Supporting Actor Oscar next year for a remake of Terms of Endearment. Follow the evidence trail, below, and judge for yourself. The initial pass at the list of shuttered dealers showed they had donated, in the aggregate, millions to Republican candidates and PACs and a total of $200 to Barack Obama. In fact, I have thus far found only a single Obama donor ($200 from Jeffrey Hunter of Waco, Texas) on the closing list. Another review of all 789 closing dealerships, by WND, found $450,000 donated to GOP presidential candidates; $7,970 to Sen. Hillary Clinton; $2,200 to John Edwards and $450 to Barack Obama. Dealer Jim Anderer told Fox News’ Neil Cavuto he can’t comprehend how his dealership can be among those killed: he stated that his sales volume ranking is in the top 2 percent of all dealers. The odds of a non-partisan process being employed can best be illustrated by RLJ. Smith examined RLJ’s markets, which I’ve illustrated below. Springdale is about 15 miles south of Bentonville. 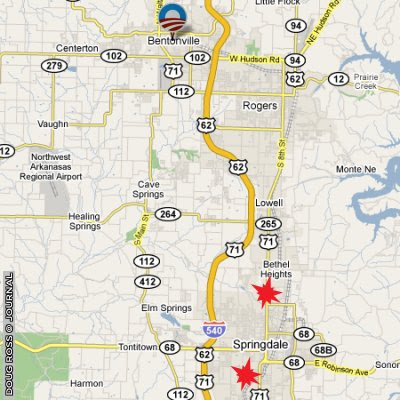 The 2 Springdale dealerships gave no money to any political candidates since 2004. The 2 dealership will close in June while the RLJ-owned dealership in Bentonville will remain open. The Landers-McLarty dealership will have no other Chrysler dealers within a 20-mile radius of the dealership. 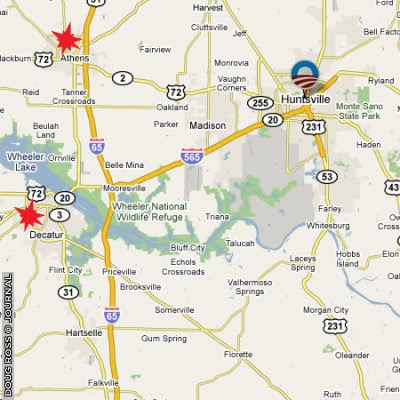 The closest competitors will be in Pineville, MO (22 miles away) and Fayetteville, AR (27 miles away). The dealerships in Athens and Decatur gave no money to any political candidates since 2004. Landers-McCarty and the Athens dealership will remain open while the Decatur dealership will close in June. 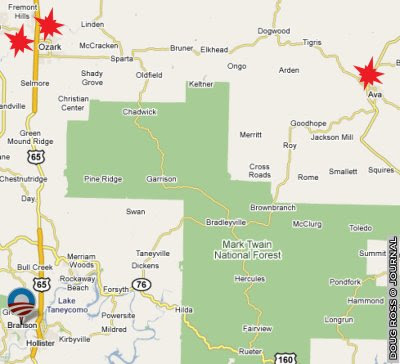 There are 4 dealerships within 30 miles of Branson, MO. Mr. Davis and Ms, Church gave no money to any political candidates since 2004. The RLJ owned dealership in Branson will remain open while the other 3 dealerships will be forced to close in June. #1 is located in Lee’s Summit and is owned by RLJ-McCarty-Landers. #2, #3, and #4 are located 9 miles northwest in Raytown, MO and is owned by Michael Crawford. #5 is located 19 miles south in Harrisonville, MO and is owned by Charles O’Quinn. The Lee’s Summit dealership will remain open while the other 4 in Raytown and Harrisonville will close. 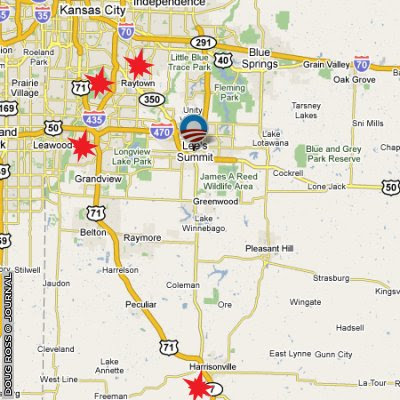 The Lee’s Summit dealership will have no other Chrysler dealerships located within at least a 20 mile radius. All of the local competition will be wiped out due to the Chrysler closings. Marshall Hebert (owner of Hebert’s Town and country) gave $4,250 to GOP candidates, $2,500 to Dem candidates, and $1,300 to the NRCC since 2004. Mr. Hebert is also on the National Auto Dealers Association Board of Directors representing Louisiana. Frank Stinson (owner of Roundtree) gave $24,000 to GOP candidates and $3,400 to Demcocratic candidates since 2004. The Bossier City dealership owned by RLJ-McCarty-Landers and the Shreveport dealership owned by Marshall Hebert will stay open. The Shreveport dealership owned by Stinson will be forced to close. Smith and various tipsters also point to Lithia Motors. Sidney Deboer will “come out a winner” due to the shutdown of various competitive dealerships. Of 29 existing dealerships, Smith reports that Lithia will likely have a net gain of three new dealers after the dust settles (they lose just two and may gain five). Debeor has donated nearly $15,000 to two Democrat candidates and approximately $8,250 to four GOP individuals. All other factors being equal, what are the odds that RLJ’s dealerships would remain open while all other area dealerships would be shuttered? The approximate odds of such an occurrence can be calculated. 789 of the Chrysler’s dealerships are closing, which represents 25% of the total (according to MSNBC). Thus, the odds that any, randomly selected, single dealership would remain open is roughly 75%. The odds that a single dealership would close is roughly 25%. In the Bentonville, AR territory, the odds that RLJ would remain while its competition gets axed is .75 * .25 * .25 = .046875 (4.6%). In Huntsville, AL, the odds are .75 * .25 * .25 = .046875. In Branson, MO, .75 * .25 *.25 *.25 = .01171875. In Lee’s Summit, MO, .75 * .25 *.25 *.25 *.25 = .0029296875. 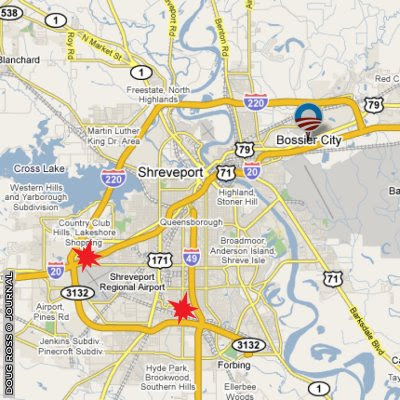 In Shreveport, LA, .75 * .25 *.75 = .140625. What are the odds of all of these RLJ dealerships remaining open while their competitors are wiped out? Maybe 1/10,000,000 of 1%. Yes, that’s one ten-millionth of one percent. Approximately the odds that I’ll win American Idol. Or that you’ll land two frisbees, simultaneously, on each of Barack Obama’s teleprompters during one of his televised speeches. Hello, mainstream media: anyone listening? How about you, class-action lawyers? What we find is that RLJ dealerships whose ownership has close ties to the Democratic Party remain open in teritory after teritory, while competitors who gave to Republicans are closed down again and again. Red State has more, offering links to stories of dealerships that are closed, and clearly shouldn’t have been, as well as describing the Republican connections to dealerships that ended up on the closure list. Richard Nixon created an enemies list of major political oppoenents in order to “screw” political enemies, by means of tax audits from the IRS, and by manipulating grant availability, federal contracts, litigation, prosecution, and by other means. If the dealership closures are a form of political attack, this would be FAR worse than Nixon’s abuse of power, simply because Nixon and Colson used a scalpal to cut at enemies; whereas Obama and his Task Force are using the equivalent of a nuclear bomb. We’re talking about somewhere around 20,000 employees at these 789 dealerships. Even Nixon never dreamed of abusing his presidential power like that.